MOV is a popular video format file originally developed by Apple. It was intended to support Apple’s QuickTime movie player and often used to save videos, movies, etc. MOV is an usable format for videos, however, it still has some compatibility issues. You may find MOV videos cannot play on many media players, smartphones and other devices. Don’t worry. A video in MOV format can be easily converted into MP4, which is widely supported across various devices. There are many free MOV to MP4 converters available but might drive you crazy with annoying marketing add-ons, slow conversion speed, and poor quality of the final MP4 output. Luckily, Gihosoft Free Video Converter solves all these problems and become a legitimate contender for the best free MOV to MP4 Converter for Windows and Mac. It comes with intuitive user interface. Even if you’re non-techy, you can easily convert MOV to MP4, AVI, WMV, MKV and any other format as you like. Additionally, you can convert MOV files to optimized preset for almost all of the devices like iPhone, iPad, Android Samsung, Huawei etc. The conversion speed is particularly great and 30X faster than other common converters. Free download and install Gihosoft Free MOV to MP4 Converter. Run it and then click “Add Media” to add the MOV file you want to convert. You can add several MOV files in one go to perform batch conversion. If necessary, you can hit the editing icon to edit the imported MOV video before conversion. This freeware provides you with trimming, cropping, adding special effects, watermark, subtitles and more. After editing the video, go back to the main interface. Then on the right side of the panel, select the “MP4” format from the available options. Choose you desired resolution before moving to the final step. Now click on “Convert” or “Convert All” button to initiate the MOV to MP4 conversion process. Upon completion, you can hit the output icon to enjoy the videos. Coming up second on our list of best free MOV to MP4 converters is the Freemake Video Converter. It is a great freeware to convert videos between 500+ formats and gadgets, including MOV to MP4, AVI, MKV, WMV, MP3, iPhone, iPad, Android, without losing quality of the original videos. No wonder it is touted as the number one free video converter for 8 years. With it, you can download streaming videos from popular video sharing sites like YouTube, Vimeo, Vevo, Dailymotion, etc. Download and install Freemake Free Video Converter to your PC or Mac. Then run the free MOV to MP4 converter on your computer. Import the MOV video file that you want to convert to MP4 by clicking on the “+Video” button or just drag-and-drop the file into the program. In the bottom of the converter, you will see multiple output options there. Click on “to MP4” to select the MP4 format for your MOV videos. Select the video parameters you desire and set the path to save the output MP4 files. Then click on the “Convert” button to convert MOV to MP4. Free MP4 Video Converter is one of the most powerful and easy-to-use MOV to MP4 converter that you can use for free. It is developed by DVDVideoSoft, which has done their due diligence to make the program’s interface intuitive, complete, fluent, and user friendly. DVDVideoSoft Free MP4 Converter has a super fast conversion speed and is compatible to a number of video formats, including MP4, MOV, AVI, MPG, WMV, MTS, FLV, MKV, etc. 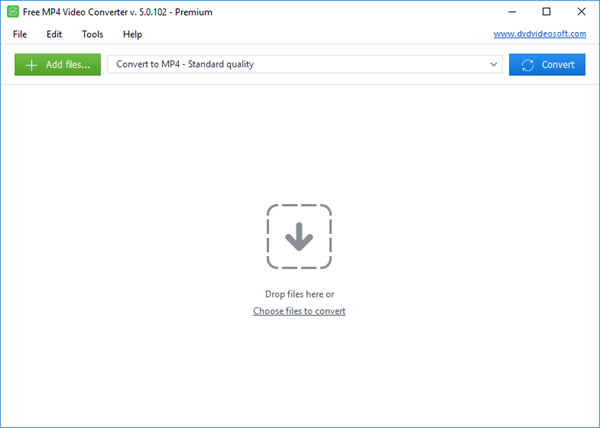 Download and install Free MOV to MP4 Video Converter on your computer, the launch it. There’s no spyware or adware, and absolutely free and safe to run. Click the “Add files…” button to select the MOV video files you want to convert to MP4 from your computer. Also you can drag and drop MOV files to the program. In the drop-down list of Presets, select “Convert to MP4 – Standard quality”, then click the “Convert” button to initiate the MOV to MP4 conversion process. Are you looking for the best approach to get a MOV to MP4 converter free of charge? Well, your search ends here and the above listed converters are right for you. These tools are your free ticket to have an opportunity to watch your favorite video in high quality MP4 formats. Available for use on both windows and mac, they work at high conversion speeds and can adequately perform a number of tasks such as editing and downloading video online. So go ahead, make your pick.